We created our patented process to demonstrate transparency and to create a standardized, real carbon credit. These real carbon credits can be seen and touched and come from a US farmer's or rancher’s field. ECCI™ built its process from the record keeping requirements used by the US Federal Crop Insurance Program. Congress first authorized Federal Crop Insurance in 1938 as an experimental risk management tool available to depression era farmers. A program with clear practice guidelines was developed to mitigate farmers' risk while also minimizing fraud. In 2016, more than 290 million acres of farmland were protected, paying claims on losses averaging about $1.7 billion per year. ECCI™’s patents expanded the value of a crop to include the carbon content of the plant. ECCI™ real carbon credits were created by combining the carbon content of specific crops with their measured, harvested yield, using proven science and accepted production history accounting practices. 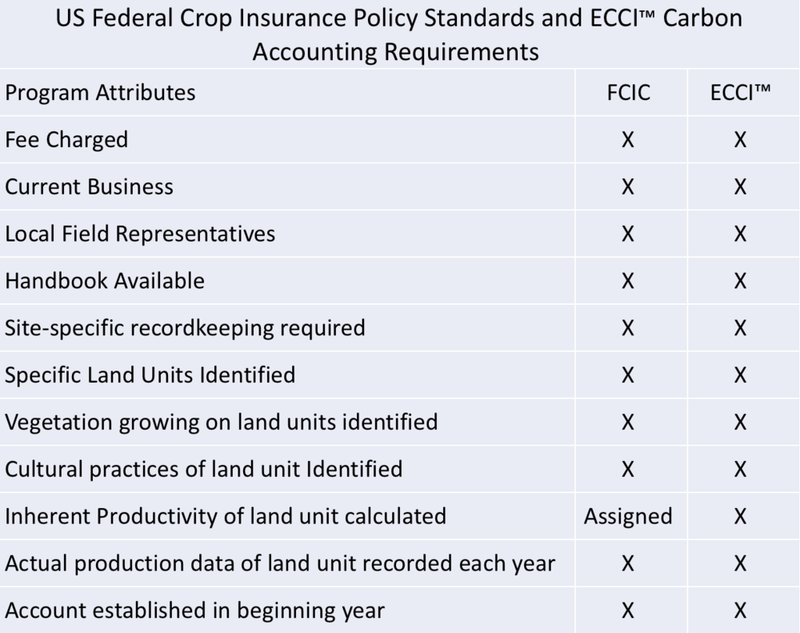 The table below shows the similarities between Federal Crop Insurance Corporation Accounting Requirements for Actual Production History Policies and accounting requirements for unbiased, certifiable, verifiable Carbon Credits Quantified by Environmentally Correct Concepts, Inc.